H&R Block (NYSE: HRB) is offering $50 to current Rush Card prepaid card users who apply for and receive the award-winning H&R Block Emerald Prepaid MasterCard® from now until November 18, 2015. Any Rush Card prepaid card user who visits a participating H&R Block tax office and presents their current Rush Card is eligible to participate in the $50 Try Emerald promotion. Those who participate in the promotion will, if approved for an Emerald Card, receive $50 loaded to their new Emerald Card, which recently was named the No. 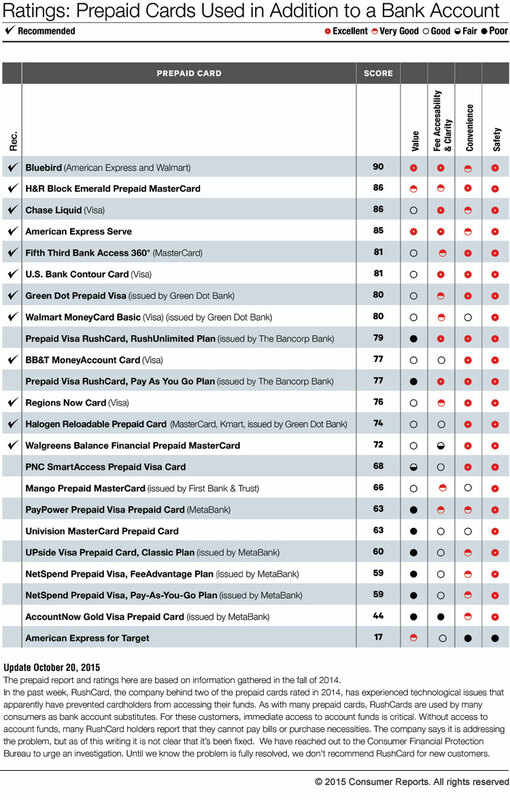 2 overall prepaid card by a leading consumer group and publication. The Emerald Card was among the top cards in convenience and safety while also scoring high in overall value. The Emerald Card is one of the three largest prepaid cards in the country and ranks among the top three consumer-friendly prepaid cards by Bankrate.com. The Emerald Card Mobile BankingTM app was named a 2013 Outstanding Mobile Wallet and Mobile Application by Paybefore. The Emerald Card also was named Best in Category and Top of Wallet by industry publication Paybefore in 2014, and in 2015 Paybefore recognized it as a Consumer Champion, joining what is fast becoming a long list of industry accomplishments. Consumers can find an H&R Block location near them by calling 800-HRBLOCK or at www.hrblock.com. To participate in the $50 Try Emerald Promotion, users must bring their active Rush Card prepaid card to any H&R Block retail tax office and apply for the H&R Block Emerald Prepaid MasterCard. If the Emerald Card application is approved, Emerald Financial Services LLC will cause a one-time $50 load to the Emerald Card of each eligible participant. Current Emerald Card holders not eligible. At participating locations only. Must have valid ID and be of legal age to apply. Not all applicants will be approved. One $50 load per eligible Card Account. The $50 Try Emerald Promotion starts November 5, 2015 and ends by November 18, 2015. The H&R Block Emerald Prepaid MasterCard® is issued by BofI Federal Bank, Member FDIC, pursuant to a license by MasterCard International Incorporated. Emerald Financial Services, LLC is a registered agent of BofI Federal Bank. MasterCard is a registered trademark of MasterCard International Incorporated. Not available at all locations and to all applicants. Additional fees, terms and conditions apply. ID verification required. Consult Cardholder Agreement for details on fees, terms and conditions. H&R Block, Inc. (NYSE: HRB) is the world’s largest consumer tax services provider. More than 680 million tax returns have been prepared worldwide by and through H&R Block since 1955. In fiscal 2015, H&R Block had annual revenues of nearly $3.1 billion with 24.2 million tax returns prepared worldwide. Tax return preparation services are provided by professional tax preparers in approximately 12,000 company-owned and franchise retail tax offices worldwide, and through H&R Block tax software products. H&R Block also offers adjacent Tax Plus products and services. For more information, visit the H&R Block Newsroom at https://www.hrblock.com/tax-center/newsroom. BofI Federal Bank is a federally chartered, FDIC insured, full-service bank that provides a wide variety of deposit accounts, as well as financing for single and multifamily residential properties, small-to-medium size businesses in target sectors, and select specialty finance receivables. With approximately $6.3 billion in assets, BofI Federal Bank provides consumer and business banking products through its low-cost distribution channels and affinity partners. BofI Holding, Inc. (NASDAQ: BOFI) is the holding company for BofI Federal Bank. BofI Holding, Inc.’s common stock is listed on the NASDAQ Global Select Market under the ticker symbol BOFI and is a component of the Russell 2000® Index and the S&P SmallCap 600® Index. For more information regarding BofI Federal Bank, please visit www.bofifederalbank.com. Learn the benefits of the Emerald Advance™ and how to apply in an H&R Block office for up to $1,000 today.